Everybody knows Sabrina Spellman - she's 'that cute little witch' from Archie Comics, played by Melissa Joan Hart in the '90s sitcom, Sabrina the Teenage Witch. And this being the era of reboots, you may have heard that everyone's favorite sorceress was coming back in a new Netflix series, The Chilling Adventures of Sabrina. "Oh goodie!" you may have thought. "I can't wait to relive those bygone years with canned laughter and wisecracking cats." 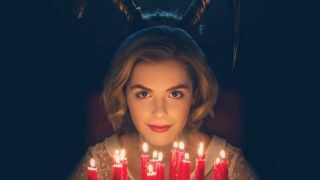 "The Chilling Adventures of Sabrina tells the story of Sabrina Spellman (Kiernan Shipka), a half-witch half-mortal teenage girl. She’s been waiting her whole life for her 16th birthday, but something wicked this way comes, forcing her to choose between the path of light and the path of night." Shocking as it may be, this isn't actually that new of a take on the character. A comic series of the same name has been running since 2014, when publisher Archie Comics worked to reinvigorate its various franchises. It's written by Roberto Aguirre-Sacasa, who also led the Riverdale adaptation for the CW. Aguirre-Sacasa is also penning and producing the Netflix series, so if you want a head start on what you can expect from this live-action retelling of a retelling, I highly suggest you check it out. And hey, if you want the old, wholesome Sabrina, all seven seasons of Sabrina the Teenage Witch are streaming on Hulu and Amazon Prime Video. It's too early to judge The Chilling Adventures of Sabrina, but if you're looking for more quality entertainment, check out our list of the best new TV shows of 2018.